I’ve covered a lot of puzzle-centric Indiegogo and Kickstarter campaigns in the blog, because I think it’s fascinating how many puzzle variants there are, and how many puzzle-loving creators are enthusiastically seizing the opportunity to add their own delightful gaming and puzzling twists to the market. In previous posts, we’ve seen Baffledazzle‘s jigsaws with a twist, Completely Puzzled‘s community-building outreach, and 64 Oz. 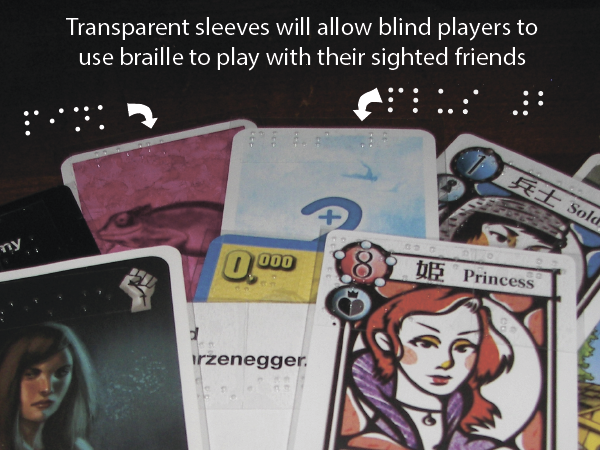 Games‘ campaign to adapt popular board games and card games for vision-impaired players. Some very creative and worthwhile projects have been realized with the help of crowdfunding. Heck, several of the games and puzzles showcased at last month’s New York Toy Fair were brought to life thanks to crowdfunding! So here are a few more projects that I think are worth your time. The Maze is a series of Choose Your Own Adventure-style books with a curious puzzly twist: they place the reader inside a labyrinth and challenge you to read through the book and escape! It’s an extended spacial-awareness puzzle where you need to visualize where you are in the maze at all times, overcoming obstacles and pitting your memory against the labyrinth itself. A third of the way to its funding goal, The Maze envisions a series of mazes of varying difficulties for readers to tackle. It’s an intriguing take on a classic puzzle genre. For a more traditional puzzle product, there’s The Grid. This multi-colored visual delight challenges players to place all of their tile pieces on the board before their opponents, mixing luck and strategy in a Qwirkle-style battle. The Grid combines clever tile design with visually arresting gameplay, and the campaign has already reached its initial funding goal, meaning that additional donors are helping to refine the game with higher quality pieces and other add-ons. From the elegant to the gloriously silly, our next campaign is Munchkin Shakespeare. This latest edition of Munchkin from the team from Steve Jackson Games adds a literary touch to its famous line of puzzly card-battle games, as players do their best to team up, betray each other, and run amok in the hopes of gaining loot and escaping combat intact. The bard himself and characters from his most famous plays are unleashed in cartoon form, ready to wreak havoc in all sorts of creative ways, wielded by cunning players and puzzlers with a penchant for sword-swinging nonsense in iambic pentameter. This is another campaign where the initial funding goal has already been reached, and with only a day or two left in the campaign, they’re pushing towards some exciting stretch goals. Our last campaign combines logic and deduction with mechanical puzzles, as the crew from ThinkFun launches their very first Kickstarter to bring Roller Coaster Challenge to life! In the spirit of Gravity Maze and Laser Maze Jr., Roller Coaster Challenge presents players with some of the pieces of a puzzle and tasks them with completing a working model with their remaining pieces. This time around, you’re building a roller coaster track, with all the soaring loop-de-loops and plunging slides you’d expect from the theme park attraction. With expansions including Kickstarter-exclusive roller coaster cars and additional pieces to create even taller, more complex models, this one could be a winner. Will you be able to complete the numerous twisting, turning variations, or will the perfect roller coaster track elude you? But before I go, I want to revisit a previous Kickstarter success story that we’ve covered in the past: The Maze of Games. Mike Selinker’s interactive puzzle novel has been on the market for a few years now, and as far as he knows, no one has conquered the final maze in the book. And to give solvers a better chance at completing the book, the diabolical puzzlesmith has created The Theseus Guide to the Final Maze, a tie-in story with hints for cracking the most diabolical puzzly labyrinth that giant tome has to offer. It’s only available for a short time, so if you’re hoping to one day best The Maze of Games, be sure to snag a copy! And let us know if any of these puzzly Kickstarters piqued your interest! With so many worthy projects and products in the pipeline, hopefully one of them catches your eye and receives your support! Munchkin like you’ve never seen it before! You’re probably familiar with the concept of the pop-up store. You know those costume shops that open up around Halloween, or the ornament shops in the mall at Christmastime, or the random spots selling fireworks during the summer? Those are pop-up stores, opened by retailers for short-term runs. And our friends at Steve Jackson Games are opening a pop-up Munchkin store in New York City for three days next week! From Friday, February 13 to Sunday, February 15, 353 West 46th Street will be the home of Munchkin World NYC, your one-stop shop for Munchkin games, goodies, exclusives, and events, including autograph signings by creator Steve Jackson, artist John Kovalic, and Munchkin Czar Andrew Hackard. For the uninitiated, Munchkin is a hilarious send-up of the classic roleplaying scenario: the dungeon romp. Encouraging players to team up to battle monsters (and betray each other as often as possible for the sake of treasure), it’s a marvelous mix of puzzly strategy and luck. With numerous expansions covering everything from pop culture to the apocalypse, from zombies to Christmas, Munchkin has become one of the standard-bearers for the modern board game and card game industry. For full details on the three-day event, click here! And for any Munchkin fans in the audience, a few questions: Are you planning to attend? What’s your favorite edition of Munchkin and why? I’d love to hear from you. It’s Follow-Up Friday: Games Across the World edition! And today, I’d like to revisit International Games Day! 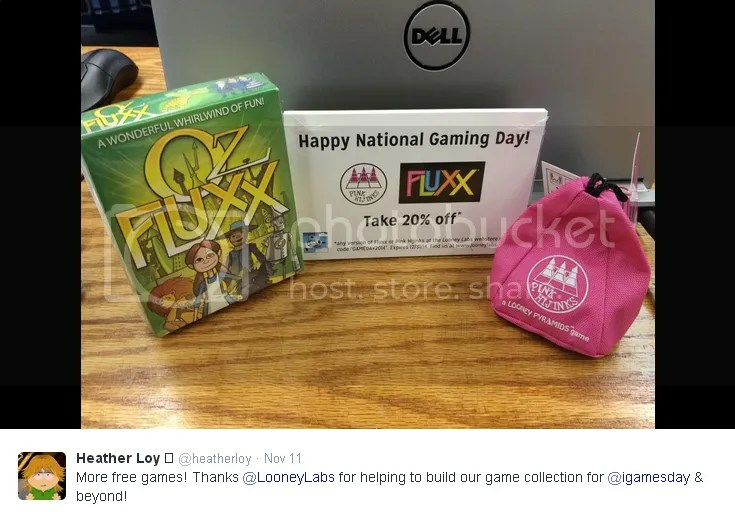 The American Library Association has been promoting community through gaming for years with International Games Day, and last Saturday, November 15, was the latest edition of this marvelous holiday. 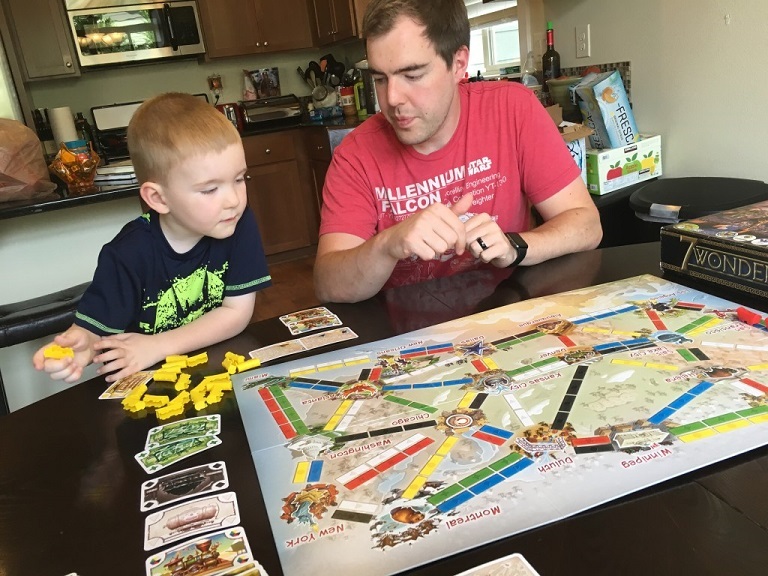 Libraries across the world opened their doors to puzzle fans, board game devotees, card players, gamers, and especially families, inviting them to socialize and share culture through a common medium: games! I’ve been meandering through photo archives, checking out all the great events and fun ways people have gotten into the IGD spirit. 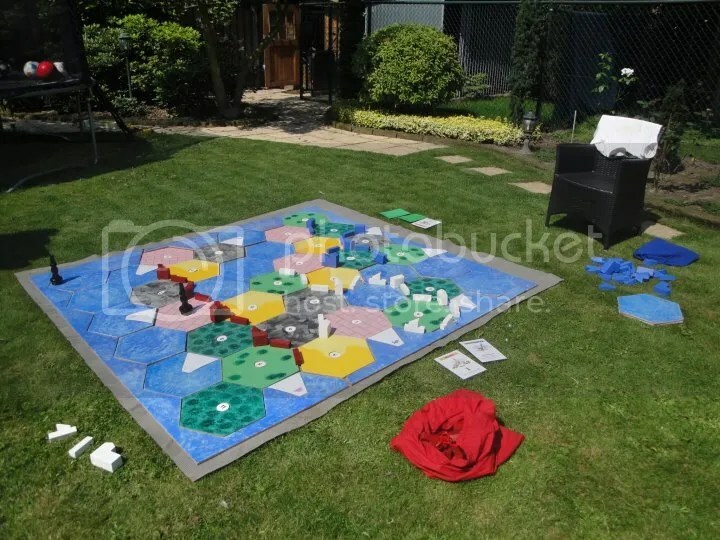 Check out this giant-sized Settlers of Catan board, created by one intrepid dad so more kids could get in on the fun! 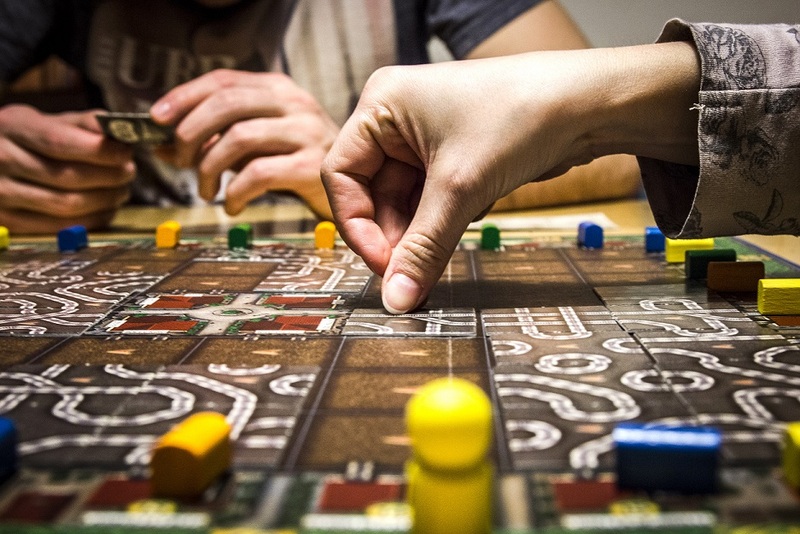 Each year, game and puzzle companies donate to libraries, giving both needy libraries and newbie game players the chance to try out some terrific games. 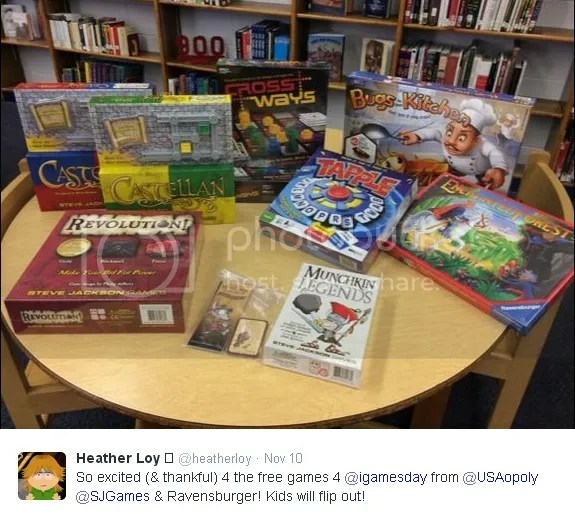 This year was no exception, as Ravensburger, USAopoly Games, Steve Jackson Games, and Looney Labs all donated games to various libraries in support of this terrific holiday. But, of all the anecdotes I’ve encountered, my favorite concerns an event hosted at last year’s International Games Day: the Global Gossip Game. You know the game Telephone, right? Where you whisper a message in your friend’s ear, and they whisper what they heard to another person, and so on and so on, and eventually, you see how the original message has changed from the beginning? Imagine that, but touching all 7 continents. The game began in Geelong, Australia, as “Play is training for the unexpected” (from a paper by biologists Spinka, Newberry and Bekoff). “Clouds travel around the world” in Talkeetna, Ark. In all, the GGG had 840 participants and ran for 29 hours straight, through 74 libraries in 18 international jurisdictions and 6 languages. The longest branch traveled 114,609 kilometers (71,230 miles), and the total distance traveled was 151,927 kilometers (94,423 miles). Now THAT is some international community building. And I’m overjoyed to have Andrew Hackard as our latest 5 Questions interviewee! Munchkin is a hilarious send-up of the classic roleplaying scenario: the dungeon romp. Encouraging players to team up to battle monsters (and betray each other as often as possible for the sake of treasure), it’s a marvelous mix of puzzly strategy and luck. 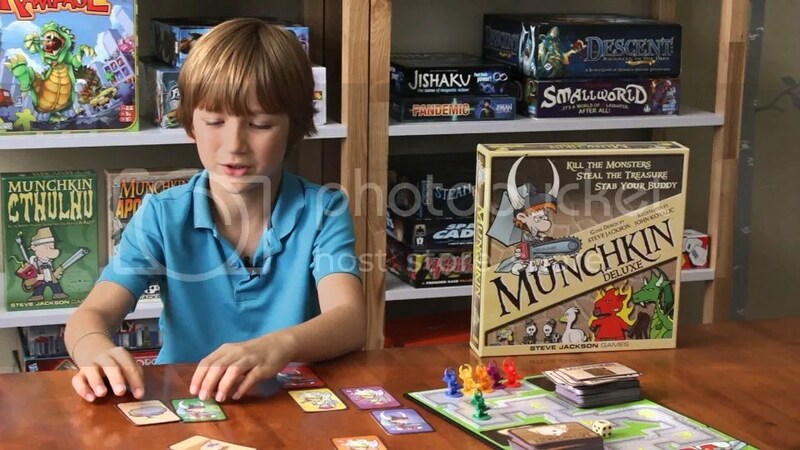 With numerous expansions covering everything from pop culture to the apocalypse, Munchkin has become one of the standard-bearers for the modern board game and card game industries. And when it comes to all things Munchkin, Andrew Hackard is your go-to guy. 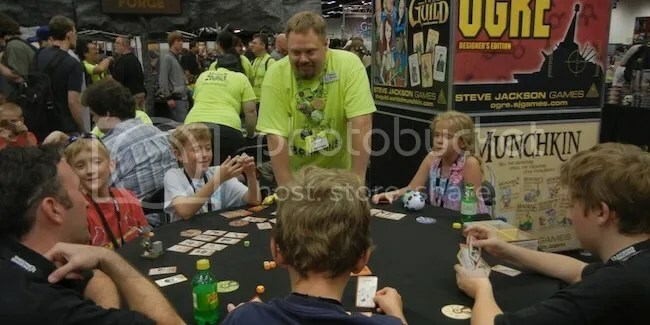 As the Munchkin Czar for Steve Jackson Games, he oversees the brand as a whole — at this point, he’s practically synonymous with Munchkin — and helps to offer a unified vision of the franchise while guiding it into new, unexpected territory. Andrew was gracious enough to take some time out to talk to us, so without further ado, let’s get to the interview! 1.) Everyone hopes for a great job title, something that’ll look sharp and impressive on a business card. Your title is Munchkin Czar. Can you tell us what that entails? Also, why “czar” and not something like “wrangler” or “overlord” or “almighty omnipotent entity and big cheese”? It’s a little daunting to realize that out of seven billion people, I am the only one to have this job title. (If that’s not true, please don’t tell me.) It certainly does get me into some interesting conversations when I hand out my business card! When Steve and Phil rehired me, back in 2009, Steve’s first thought for a title was “Brand Manager” — in fact, I have some cards with that title that I give to people who regularly wear neckties and sport coats. But Steve quickly decided that he didn’t know what a Brand Manager did, and he knew what he wanted ME to do — oversee all the day-to-day mundane operations of the Munchkin line, so that his time was freed up to write games rather than tracking sales figures and planning reprints and fussing with spreadsheets. For whatever reason, “Czar” was the title we came up with. It has the advantage of being both impressive and vague! Over the past five years (!!! ), my job has evolved considerably, and now I’m doing quite a bit of Munchkin design work myself, enough that we’ve started talking about maybe hiring *me* a Brand Manager to track sales figures and fuss with spreadsheets! 2.) How do you decide what the next theme or expansion will be for Munchkin? Are there any favorite cards or additions that really sold you on a given idea? 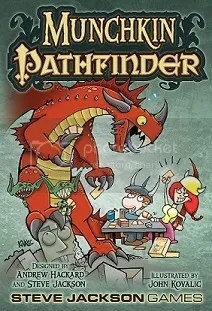 Is there anything that, as a board/card game fan yourself, you loved bringing to the Munchkin universe? Munchkin Apocalypse grew out of a desire to commemorate (i.e., mock) the 2012 hysteria. 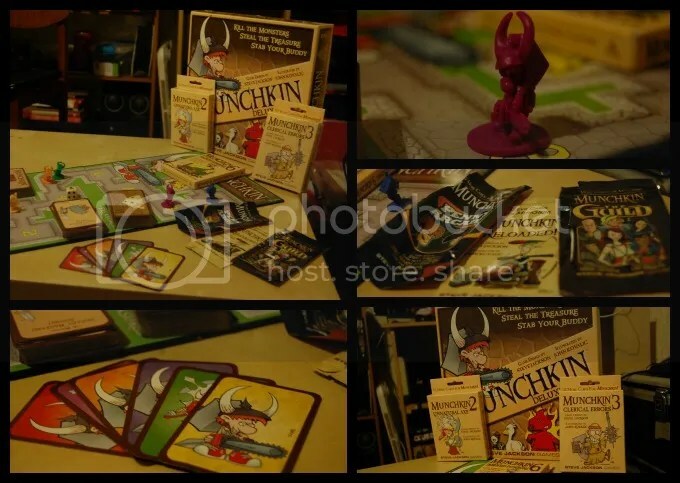 Munchkin Legends was a set lots of our fans had suggested, and it worked well as a new fantasy set when we needed one. Our licensed sets (Axe Cop, Conan, Pathfinder) have all been targets of opportunity, and every one has been both a challenge and a blast to work on — all for different reasons. So far, I think the most fun I’ve had designing a Munchkin set was Munchkin Apocalypse, because the Seal mechanic was completely new and a real design challenge. The first version we tried was way too hard — playtesters almost universally said it felt like they were fighting the game, not the monsters (and not the other players). 3.) You’ve also had a hand in guiding GURPS — short for Generic Universal RolePlaying System — as well as developing the most recent addition of Ogre. All of these projects involve longstanding legacies and expansive rule sets that must be quite a puzzle to work with. How do you mix and match the needs of the player with the high expectations involved? To correct a minor misconception, my involvement with Ogre was more as a Kickstarter consultant than an Ogre developer — and there are times I wish I’d been a much louder consultant. (But wow, it’s an amazing achievement in game design and production!) Other than that, all I did for Ogre was keep the Munchkin train on the tracks so we could afford to print the sucker. With GURPS, I was fantastically lucky to work with the best RPG line editor in the business, Sean “Dr. Kromm” Punch. Kromm took care of all the rules issues and made sure that the manuscripts were consistent with the rules that had gone before. That freed me up to worry about issues of text quality, book production, and of course scheduling. I’m really proud of the work that Kromm and his team did on GURPS, especially on the Fourth Edition launch — editing the entire Basic Set was six months of hard work, but having him there to consult made it go so much easier. It’s no exaggeration to say that my work on GURPS Fourth Edition was invaluable when I undertook to revise the rules and cards over the entire Munchkin line in late 2009 and 2010. We had decided to upgrade the visuals on the core Munchkin game, to use full-color art instead of the shades of brown that it used to be, and as long as we were going to be changing the set that much, we decided we could afford to sand down a few other rough spots. It turned out to be quite a bit more of an undertaking that we had originally planned, but the result was a more consistent set of rules (on six pages instead of four, so old, tired eyes like mine could read them! 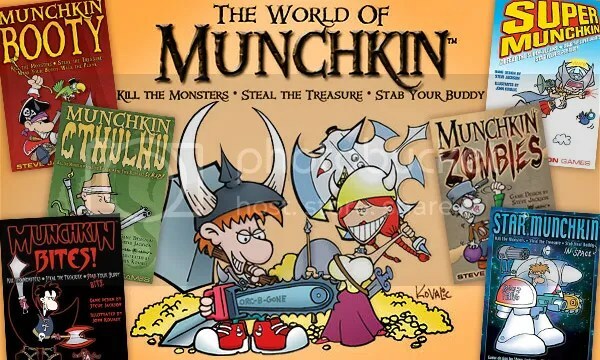 ), and the removal of a few design choices that were fine as one-off jokes in 2001 when Munchkin was a stand-alone game, but had started to become VERY frequently asked questions in 2009 when there were nine Munchkin core games and a dozen expansion sets. We thought about calling this a new edition, but it really wasn’t — it was just a refinishing job on the existing game. 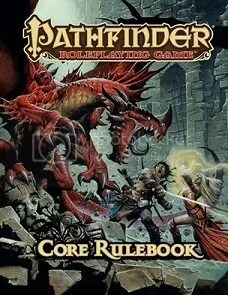 Ultimately, we compromised and updated the rule version number to 1.5 (with a tip of the hat to D&D in the process). A lot of the updates we made in ’09 have helped shape the new sets — I think Steve and I both have a clearer understanding of the “Munchkin engine” than we did before that process started. The sets starting with Munchkin Zombies have been a lot more internally consistent, I think, because now we know when a rule doesn’t “feel like Munchkin.” Which is not to say that the earlier sets were bad — far from it! — just that the work of looking at every single card taught us a lot about the game. I certainly hope Steve would agree! 4.) What’s next for Andrew Hackard? At the time of writing this, we’ve just sent Munchkin Apocalypse 2 to print (it’ll be out in the spring of 2014) and I’ve finished writing a couple of expansion sets for later next year. We have several booster packs planned for 2014, and a few surprises, too! Our biggest news, though, is that Steve, Phil, Ross Jepson (our Director of Sales), and I sat down for an all-day meeting in Dallas during BoardGameGeek Con, and we not only planned out the entire 2014-2015 schedule, we even started putting some things on the board for 2016! I wish I could tell you about all the Munchkiny goodness coming down the pike, but I have been sworn to secrecy. Suffice it to say that I think our fans will be very pleased indeed, both with the new games coming out and the new support for some classics that haven’t seen a lot of love lately. As long as we don’t start competing with ourselves, we’ll be fine. I’m also working on a couple of *new* goodies in the Munchkin sphere, one planned for late 2014 and one for 2015, and I’m really looking forward to being able to talk more about them as their release time draws closer. Right before our holiday break, I got the go-ahead to dust off something *non*-Munchkin that I’d been working on awhile back, so I’ll get a chance to stretch my skills in a whole new direction as well. I expect 2014 to be an amazing year for me, personally, as well as for fans of Munchkin and of Steve Jackson Games in general. Wil Wheaton talks about being an advocate for what you love, not a detractor for what you hate, and I think that’s very important. Gaming is a huge field and getting bigger all the time, and life’s too short to get into arguments about taste. Have fun playing what you like, be a positive spokesman when someone expresses interest in what you’re playing, and try new games when you get the chance, because you never know when you’ll find your next favorite game — or when you’ll teach someone THEIR favorite new game. For the aspiring designers out there, my best advice is simple: play games. Play LOTS of games. Take notes on the rules you like and the rules you don’t, and think really hard about why those rules were designed the way they were. (Don’t be surprised when the answer is, “It seemed like a good idea at the time.” That’s how Munchkin started!) If you’ve never studied technical writing, consider taking an introductory class at your local community college, because rule writing IS technical writing. If you confuse the players, they won’t play your game. Go to conventions, if you can afford it; you’ll never get a better chance to show your game prototype to people who are eager to see the next hot new thing, and you may get a chance to meet and schmooze your favorite game designers, if you’re polite and well-groomed and willing to buy the first round. Ultimately, that’s what it’s all about — having a good time with your friends. Keep that in mind, and you’ll be far ahead of the game. Many thanks to Andrew for his time. Check out all things Munchkin on the Steve Jackson Games website, and be sure to follow Andrew on Twitter (@redpenofdoom)! As a fan, I cannot wait to see what he and the Munchkin team come up with next.